Common sense? Sense, yes - common, not! nOrh's Michael Barnes isn't the designer of today's amp. No, he is 'merely' a very successful computer programmer-entrepreneur who, four years ago, launched an audio company in Thailand. Its present annual gross exceeds that of some name-brand audio companies that have operated for the same duration in the US - and, his bottom line isn't derived from deep-margin mortgage sinkers but extreme value-priced components, mostly in the <$500/per category. With nOrh, Barnes pulled that rarest of albino rabbits out of his hat - prosper from selling physically heavy loudspeakers Internet-direct. In fact, nOrh products have inspired a veritable underground following. Many audio-related interactive websites and discussion forums sport dedicated nOrh boards. Those invariably document the satisfaction and steep loyalty Barnes' customers from all around the globe share unsolicitedly with each other and newbies. While his own technical background may not extend to the minutiae of audio circuits and crossovers, Barnes knows a rat when he smells one. There's the inflationary pricing that much of High-End audio has degenerated into - what he dubs the exclusive golfin' High-End Country Club. How about the many preposterous claims that don't hold water when inspected with the impartial eye of a sharp, empirically trained and technically adept mind? Barnes' tactic has been to closely investigate different audio categories. Separate the wheat (performance that's meaningful in the real world) from the chaff (costly redundancies and smoke screens). Based on case evidence and common sense, he then delivers a product brief to designer/engineers who can fill in the gaps. 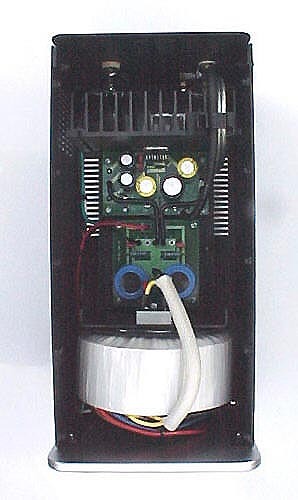 For his now discontinued tubed CD player, for example, he turned to ex-engineers of California Audio Labs that once operated out of a Thai factory. nOrh aesthetics are predicated upon passing muster with its predominantly female staff. That's an enlightened trick a lot of High-End audio companies would be wise to emulate - if they were truly (and not just lip service-wise) intent on addressing a larger audience instead of blaming a soft economy or unreasonable ad rates for poor sell-thru. Michael Barnes' personal priorities include solid, pass-to-your-heirs construction/reliabilty. He also wants looks that don't require the common lame audiophile excuses - you know, "but it sounds good". You've gotta forgive his audiophile anti-christ antics - Barnes believes it should sound and look good - and remain really affordable. If he wasn't so darn successful, you'd say he lived on one of the six moons rather than in Thailand. His products are audiophile in terms of performance and what they compete with if you take the trouble to find out. Yet he doesn't consider nOrh an audiophile company at all. Rather, he wants to reach the music lovers who think High-End's somewhere uptown. The kind who spend their money on inferior rack systems and boom boxes because they don't know better. This is the market Barnes wants to address. Accordingly, that's what his products are priced to go up against. The floor just opened for trading turds against truffles - where's my highfalutin' broker when I need him? For his $295/ea. Le Amp monoblocks, Barnes turned to Curt Wishman of IRD Audio [left] who seems intent on emulating the speaker-focussed nOrh-direct approach in the amp/preamp arena. 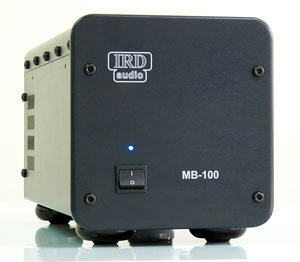 nOrh's Le Amp is Curt's IRD MB-100 - the large white IRD logo retained on Le Amp gives open credit where due. Visually, this logo is the only element that spells nOrh's aesthetics backwards. Its prominent size and white-on-black starkness are just barely this side of - well, not outright vulgar but - say a mite tacky? And that's it, folks - for complaints, nits and niggles. A perfect amp then? Just about. You see, this soft qualification's already a sign of evil audiophile perversion. Who else but an audiophile dunce/dickhead reviewer would insert a $590 pair of 100w solid-state monoblocks with 400VA mummy-quiet toroidal transformers into a system comprised of $18,000/pr hornspeakers, $10,000/pr resident SEP monos and $400 power cords that cost more than the amps themselves? For crimminy's sake, that's sick, very very sick. For the full measure of spec'ology, see either the nOrh or IRD sites. The basic vitals are as follows: dimensions of 6.5" W x 7.0" H x 12.8" D; weight of 23 lbs; 26dB of gain; a rail voltage of 40V; 400 watts of power supply with 35A bridge rectifier and 20,000uF reservoir capacitors, i.e. what its maker claims is "five times the size of a normal 100-watt consumer grade amplifier's power supply"; instantaneous peak power of 160/240W Class A/B power into 8/4 ohms; flat frequency response of 7Hz to >100KHz; an 8mm thick machined aluminum front panel; solid aluminum machined feet with Butyl inners; stainless steel and black nickel finished hardware; a 2mm thick steel chassis; an easily removable top cover; detachable power cord; and the wake-me-I'm-dreaming price: $295 each. Le Amp looks identical but sports a "Le Amp" silk screen instead of Curt's "MB-100". See what I mean about the IRD Audio logo? 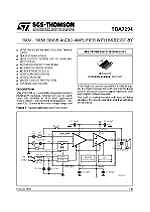 Le Amp joins a small cadre of amps that include 47Labs and Jeff Rowland Design Group by using ICs for output devices. Wishman's chosen weapon isn't the 60-watt National chip legendary perfectionist Jeff Rowland used in parallel-bridged mode in the Concentra I, but the equivalent TDA7294 by French ST SGS-Thomson MicroElectronics that I understand may be used in the Concentra's current iteration. If I'm wrong, my sources tell me that the National and ST chips are as competitive as Burr-Brown and Crystal in the digital arena. By clicking on the document to the left, you can download a 16-page PDF documenting the performance and installation requirements of this chip. From what I can glean, it's a monolithic integrated device that uses a Bipolar transconductance input stage, a MOSFET gain and level shifting stage and a MOSFET final output stage; avoids Boucherot cells -- whatever the heck those are -- and turn on/off switching noise (that I do understand and appreciate) and is self-protected against shorts or thermal damage with an auto-mute overdrive protection function. The output stage uses a large-signal, high-power DMOS unity-gain buffer and local feedback via a differential amplifier block. The TDA7294 is spec'd for up to 180W peak power but the maker warns that power dissipation is hardly manageable at this actual power range. 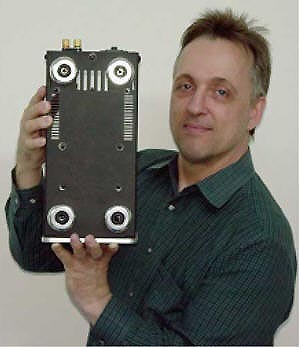 To avoid prematurely triggering thermal shutdown and maximize the chip's innate output potential, Curt Wishman uses massively overbuilt heatsinks that supposedly improve performance beyond ST's stated specs for the TDA7294. The trick is apparently to keep this chip puppy cool so it won't growl and bite. 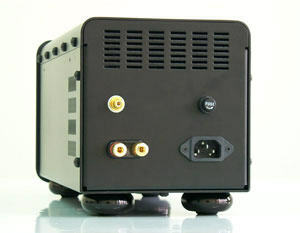 Even after 24 hours of nonstop punishment, Le Amp doesn't exceed barely lukewarm - a testament to Wishman's highly effective self-cooling chassis architecture. A tastefully small blue power LED with just the right intensity adorns the front panel with its rounded corners that extend lengthwise to the rear. 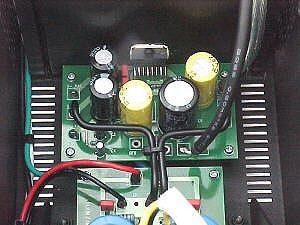 There you're greeted by chunky binding posts, a substantial RCA jack, the power IEC inlet and a 5A/250V fuse holder that indicates the amp's current limit. Flip these puppies' bellies up for brief roll-over obedience training on who's boss in your family. Those legs sticking surrenderingly up into the air are not cheap glue-back rubber bumpers. They're sizable all-metal donuts that prove how Michael Barnes' concept of quality is rather more all-encompassing than you might expect. If testing a firm's standing beyond the posh greeting room means checking the state of their toilets, then Le Amp is an all-around class act.